So, I thought it would be helpful to offer plant suggestions to all of our readers. Do you see an open never ending lawn or, maybe it’s a small enclosed area? What could you see as a focal point in your view? How do you feel about your deck? Is it quiet and cozy or more of an open space where you would prefer more privacy? The answers to these questions will begin to dictate how you landscape around your outdoor living area. Now, let’s discuss patios and low level decks and porches first. Your point of view from sitting in your chair should give you looking into (not onto) the lawn area. Basically, the lawn becomes an extension of that outdoor space. Low level sitting areas take more advantage of the opening. Colors and textures can be used effectively from the immediate areas on to the outlying regions. The view will be complete from the tree tops all the way down to groundcover. 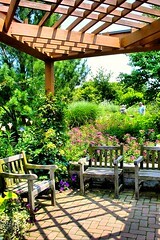 So, be sure to add in lots of colorful perennials and shrubs into the outlying landscape. Now, in landscaping around the perimeter of your low level deck (patio or porch), you will want to select plants with that in mind. If your outside living space is large and extends out considerably from the house, consider placing ornamental trees or other decorative plants. The following is a great listing of plants for this purpose. Remember to allow for stepping stones or other access to the outlying areas. In planting along the edges, select low growing plants so as to not block the outward view. Staying in the 3 ½ foot range and below should work quite well, especially with taller plants in that range that are airy at the tops such as ornamental grasses. The following lists plants that make excellent borders. When planning your landscape around high level decks and balconies, remember that you will be looking down onto the plants immediately around the perimeter and only seeing the top portions of the plants in the outlying areas. High level areas truly take on a different view of the lawn than low level areas and should be landscaped accordingly. High level decks are considered to be (roughly) 5 and 6 feet and higher off the ground. Plant for fragrance, long blooming periods, lots of texture and slightly away from the deck so you are fully able to enjoy the plants. This list of plants works nicely in such situations. Armed with this information, you can now confidently plan the landscape around your multi leveled outdoor living spaces. We offer many of the plants listed above. To locate their pages, copy the name and paste it in the search box above and click the search icon or click the enter/return key on your keyboard.